Knights of Columbus are Catholic gentlemen committed to the exemplification of charity, unity, fraternity, patriotism, and defense of the priesthood. The Order is consecrated to the Blessed Virgin Mary. The Order is unequivocal in its loyalty to the Pope, the Vicar of Christ on earth. It is firmly committed to the protection of human life, from conception to natural death, and to the preservation and defense of the family. It was on these bedrock principles that the Order was founded over a century ago and remains true to them today. Knights work to fulfill the central mission of the Order: striving in charitable works; serving the Church and unified in following its teachings; supporting brother Knights in their temporal and spiritual needs; and giving aid to widows, orphans, the sick and the poor. The Knights actively participate in many parish ministries volunteering as Lectors, Eucharistic Ministers, Ministers of Hospitality, serving on Finance and Pastoral Councils, while also sponsoring parish activities. The Knights of Columbus meet twice monthly at Holy Family. The Welcoming Committee is a group of parishioners representing various neighborhoods in our parish who welcome the newest members of our parish family. The Welcoming Committee calls all new parishioners when they register for our parish. Our new parishioners are asked a few questions and are encouraged to join in parish activities that may be of interest to them. We need help at this time to keep up with welcoming effort. If you are interested, please call the parish office. 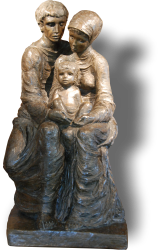 The Women's Group is dedicated to making Holy Family Parish focused on the ministry of Jesus in our world. The Women's Group gathers women from our parish who are dedicated to serving the parish community in various ways, along with aiding in the spiritual renewal of its members. The women assist in the ministry of various parish events such as the reception following confirmation, refreshments after the anointing Mass, the Lenten soup and bread dinner and church cleaning. The Women's Group works to raise funds that are used primarily but not exclusively for the purchase of vestments and sanctuary appointments. The Women's Group meets monthly. Meetings begin with prayer followed, usually, by a speaker on a topic of interest to the members, refreshments and a short business meeting. Women 18 years or older are invited to join.